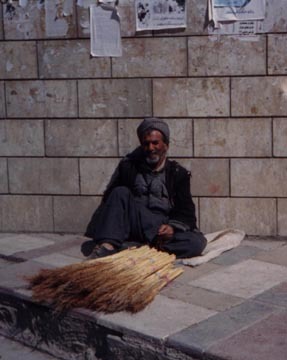 This Kurdish man selling brooms in front of a swept out and closed down bank in Sulaymaniy city after UN had imposed sanction on Iraq including Kurdistan in 1991. Kurds are confused and skeptical about this double-standard policy. On one hand, they are protected in their so-called Safe-Haven homeland under no-fly zone sky by allied air forces, on the other hand, they are under the same sanction as the rest of Iraqi controlled Saddam. This Kurdish man in the above photo had lost his entire family in the Chemical Bomb Attack on Halabja on March 16, 1988 by Iraqi barbaric regime's air forces. This suffered man had happened to be on a business trip to Hawler city when the chemical air raid eliminated more than five thousand innocent Kurds including this man's entire family. 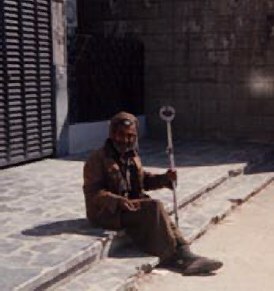 An old Kurdish man sitting in front of an abandoned bank begging for help. Nobody are secured and safe under occupation and depression by Iraqi government. Imagine if a person like this old man in this photo who had lost his home after it was razed to the ground with other's home in their village. After losing three of his grown up children, he, his wife, and his married daughter moved to Sulaymaniy where they struggle making their living.